Raised on California's historic Tejon Ranch in Kern County, which in 1874 was the 300,000 acre Rancho El Tejon, Buddy continues the Montes family vaquero tradition which began on the Tejon in the late 1800s. He is a 5th generation Native American vaquero and a member of the Tejon Indian Tribe. At a young age on the Tejon, Buddy started at the bottom of the ladder so to speak, working with vaqueros; but over time earned respect of the viejos [old wise ones] who slowly shared their knowledge of building bridle horses. He learned the purpose & techniques for using jaquimas [hackamores], and why it's critical to take the time for the two-rein stage during training, allowing a horse to "pack the bit" before finally riding straight-up-in-the-bridle [spade bit] with a finished horse. The viejos also taught Buddy the art of roping with a braided rawhide riata. In the 1980s, Buddy with cousin Leonard Montes teamed up and worked the large open-range ranches of Nevada - some had as many as 4 million acres. Remote range work often means long periods of time alone, sleeping in range tents, cooking outdoors and weathering temperature extremes, all part of the buckaroo life. 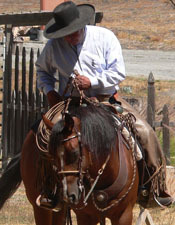 After returning to California, he worked on the Onyx Ranch in the Kern River Valley, the San Emidio Ranch in Maricopa prior to accepting the "cow boss" position for Booth Ranches in the San Joaquin Valley where he and wife Laurie worked side-by-side, horseback most every day, managing the cattle division of Booth for 15 years. Buddy currently manages a remote cattle operation east of Bakersfield, CA and has never strayed from keeping the old vaquero traditions in horsemanship, stockmanship and riata roping. It is a way of life for him. Buddy enjoys sharing his knowledge and committment to the vaquero lifestyle with those who express a desire toward understanding vaquero age-old traditions... traditions which still hold today. Buddy and his wife Laurie have worked as a team for over 30 years on cattle ranches. Make sure you meet them both at Vaquero Heritage Days 2018. Buddy will be horseback on Sunday presenting skills as a riataman.